Earlier this year, when the winter snows blanketed most of the UK, strange foot marks like these could be seen all over the place. Little Foot – younger version of big foot? Or a three footed animal? 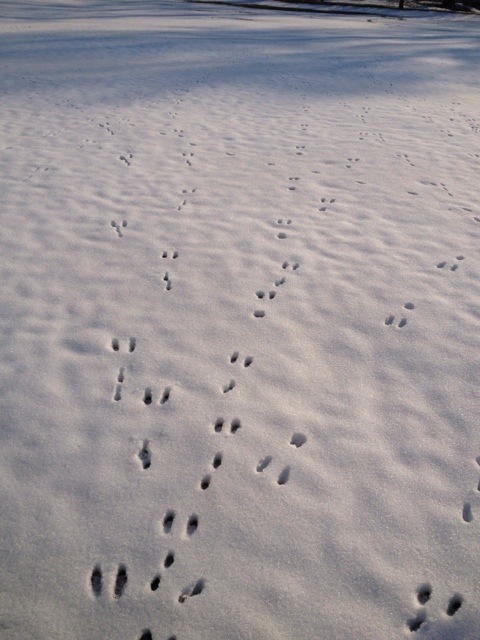 The reality is less tantalising – these were rabbits!!! I spotted this ladybird on a concrete brick last week, and couldn’t resist another opportunity to a take a picture using my macro lens. The background was dark and provided good contrast to the colour of the beetle. 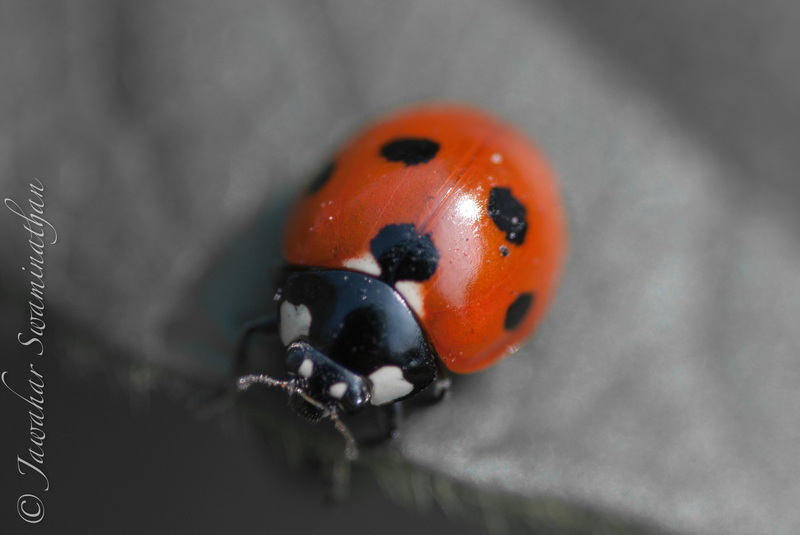 Posted on March 30, 2012 Categories PhotographyTags Arthropoda, Biology, Cambridge, Coccinellidae, Flora and Fauna, ladybird, Macrophotography, Photography, spring1 Comment on Ladybird – up close! 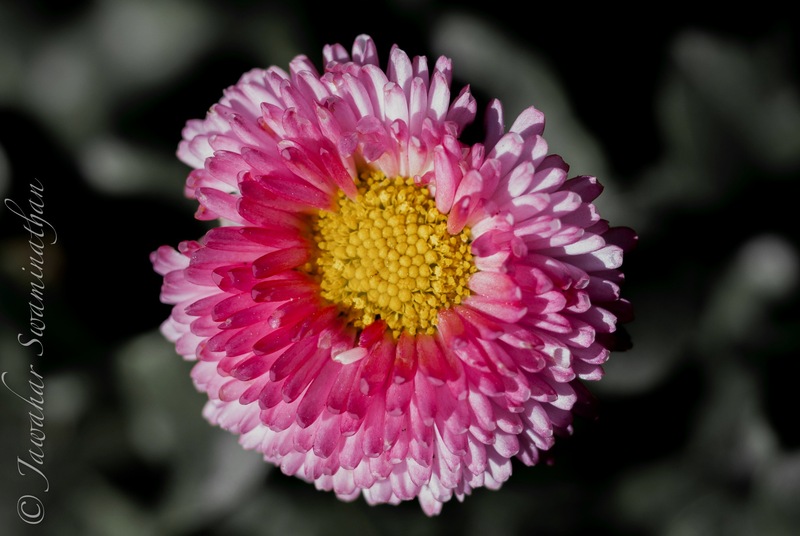 Bellis is the scientific name for a family of plants that include the common daisy. The latter derives its name from the saxon word “days eye” which describes the opening of the petals to show the bright yellow centre (eye) in the mornings, to closing them at dusk. The expression “fresh as a daisy” derives from the fact that the flower appears fresh and rested every morning. One legend has it that the Bellis is named after a nymph or dryad called Belides. According to legend, Belides was dancing in the woods with her lover Ephigeus, and attracted the unwanted attention of Vertumnus, the god of seasons, gardens, fruits and orchards. In order to avoid Vertumnus and protect her lover Ephigeus, she turned herself into the flower we know as the daisy. Farewell, till the next year! This year spring came early, very early indeed! 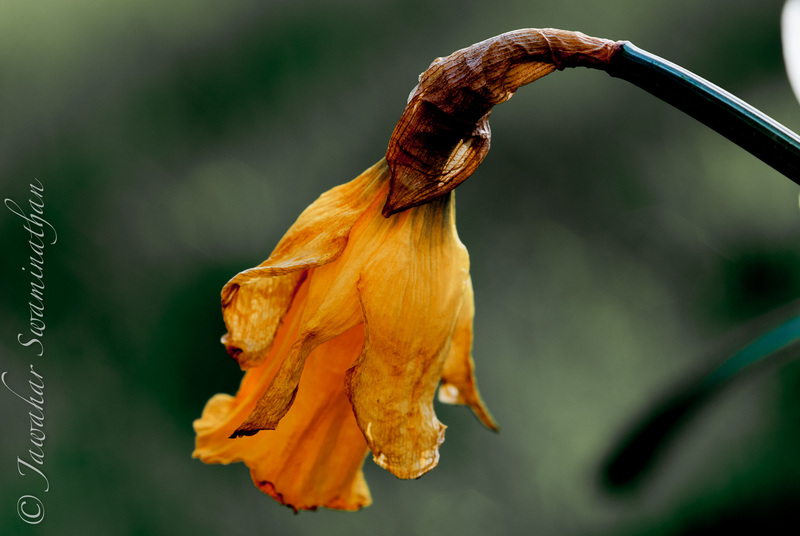 The daffodils bloomed in all their glory and now they’re beginning to wither away. So it is farewell to this flower till the next year, while the foliage stays to stock up for the long winter to come. Posted on March 29, 2012 March 29, 2012 Categories PhotographyTags Daffodil, Photography, springLeave a comment on Farewell, till the next year! Bellis: Brightening up my day! 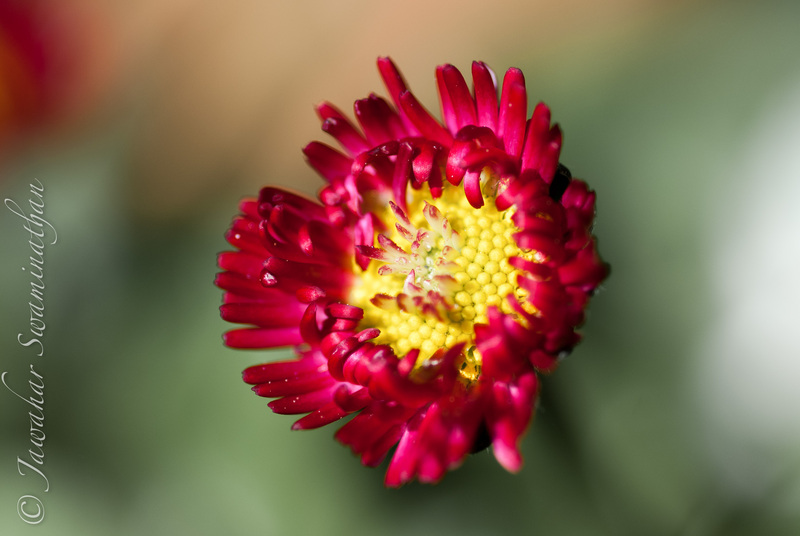 A beautiful (but tiny) Bellis flower from my garden. These perennial plants belong to the same family as Daisies (Asteraceae) and grow no taller than 20cm. Format ImagePosted on March 29, 2012 March 29, 2012 Categories PhotographyTags Bellis, Daisy, Photography, springLeave a comment on Bellis: Brightening up my day! Yawn! The clocks changed in Europe this week to move to summer time. What that meant was that we were all deprived of an hours precious sleep in the morning. 8AM was in reality 7AM! Driving to work this morning, stuck in the usual traffic jams, I go wondering on how changing clocks arbitrarily affects lifeforms that do not wear watches or have a concept of daylight saving time (which includes every known life form other than a small subset of humans that live in parts of Europe, North America, some countries in South America, parts of Australia and New Zealand). So the question I posed to myself was: is there an increased prevalence of road-kill that correlates with change of clocks? At one level, this may seem a ludicrous question, but it is a logical one nonetheless. Wildlife tend to follow sunlight and sunset to set their circadian rhythms. A part of their eating and roaming habits around human settlements is governed by human activity. Grazing deer and rabbits are common early spring mornings (6-7AM) just before human activity begins, but by 8AM they are all gone into hiding, or away from our sight. What happens when, suddenly, we decide to change our activity times and begin earlier or later? Is there an increased rate of animals being caught by surprise and getting killed on our roads and highways? How long does this last? Which change of clocks is worse for the creatures, spring or autumn? http://www.ncbi.nlm.nih.gov/pubmed/11152980 – A scholarly article that talks about increased accident rates after change to summer time in the US. There isn’t much scientific literature to support either argument: that one change of time causes more accidents than the other, or how this affects the rate of animals being killed on the roads. In any case, the effects will be short – at most a day or so before wildlife adapts to changes in human behaviour. Spring certainly does see more road kill (visually). This is potentially directly proportional to the number of animals active on the roads, and the fact that visibility is better now than in October. I would personally believe that the change from summer to standard time probably is more dangerous that the other way around. Suddenly more people are driving in the dark – increasing chances of accidents both between vehicles and with wildlife. Burdock (Genus Arctium) seeds with tenacious hooks that latch on to clothes and skin (I’m still getting some off my fleece jacket!). Traditionally dispersed by cattle. Apparently the roots of this thistle family are edible. Lots of medicinal properties according to Wikipedia. 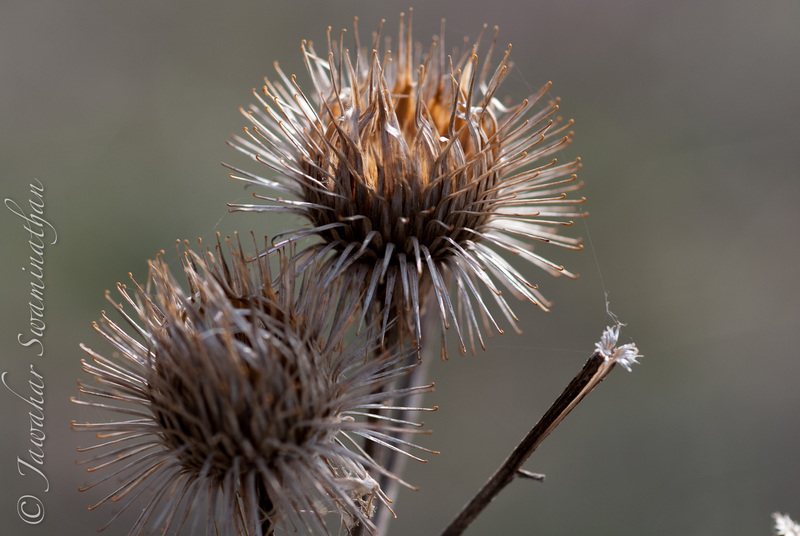 Format ImagePosted on March 24, 2012 March 24, 2012 Categories PhotographyTags Burdock, macro, Photography, SeedsLeave a comment on Here’s hooking at you!